Following a 4-8 mark in 2013-2014, not much was expected of TCU heading into the 2014-2015 campaign. Though, the additions of co-offensive coordinators Doug Meachem and Sonny Cumbie immediately led the Horned Frogs into a transformation. A notoriously stout defensive team under Gary Patterson, TCU became one of the most explosive and fun teams to watch last season, headlined by an offense that put up 46.5 points per game and had 82 points in a win over Texas Tech. Likely the biggest reason? 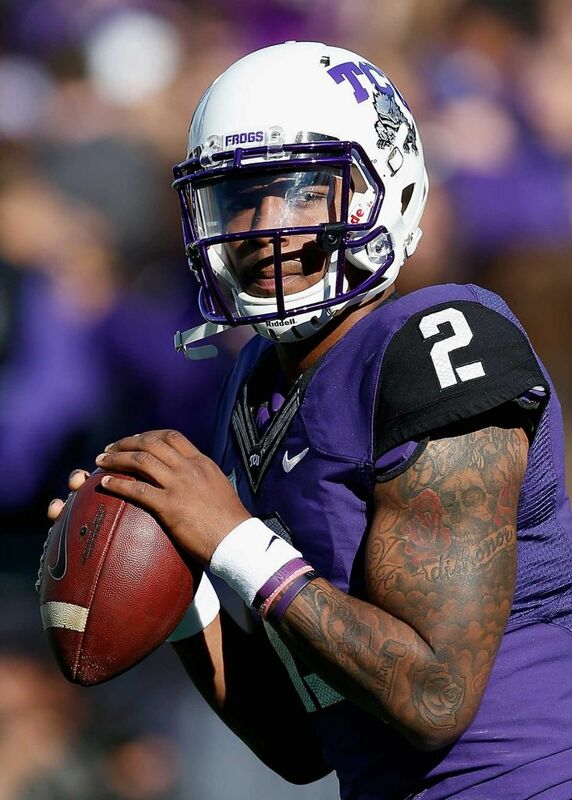 Look no further than Trevone Boykin. Boykin had spent time at quarterback during a rash of injuries to former QB Casey Pachall but looked destined to start at receiver last season, especially with the addition of Texas A&M transfer Matt Joeckel. But, Cumbie and Meachem designed a perfect system for him, and he thrived. He put up record-setting numbers and so did the Horned Frogs. But, when it was all said and done, the season ended on a sour note. After being ranked No. 3 in the Playoff poll entering Championship week, TCU dropped all the way down to six, despite a 52-point thumping of Iowa State. A blowout victory over Ole Miss in the Peach Bowl was the definition of a statement victory, and the memory of the infamous Playoff snub should serve as motivation and determination for what should be an absolutely scary TCU team, one that shouldn't sneak up on anybody this season. Backfield: No matter what way you look at it Boykin's 2014-2015 was astounding. He looked like an odd man out in the TCU offense, and then suddenly put up a memorable, Heisman-caliber season. Overall, he finished up with 3,901 yards, 33 touchdowns and would add 707 more with his legs. The gunslinger has the perfect arm and playmaking ability for this TCU offense that is loaded with deep threats. 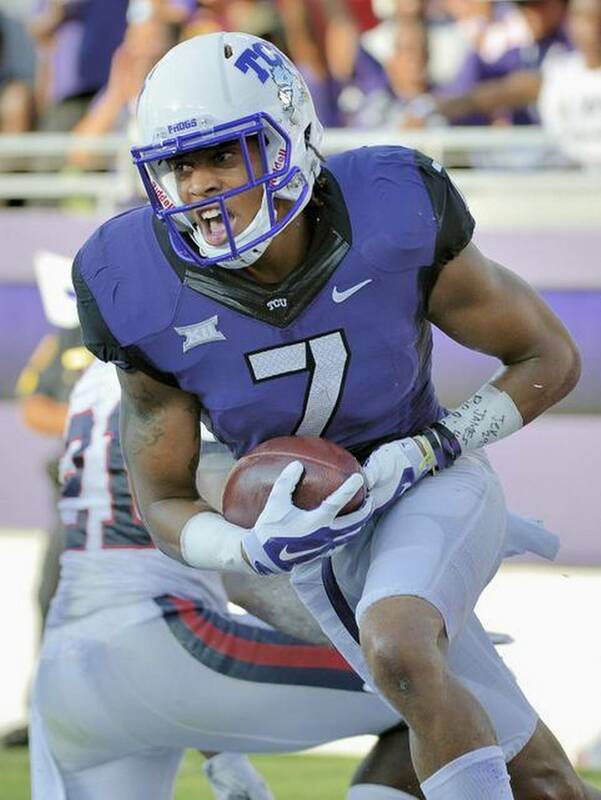 Boykin proved to be extremely scary with his legs, as evidenced by those 707 yards and eight touchdowns on the ground. That isn't surprising, considering Boykin had a legit shot to play either running back or receiver last season. Mistakes were still a problem for Boykin last season; he had 10 interceptions and did often force passes. Certainly another year under his belt, especially in a system he is now very familiar with, will help cut those down. If TCU does stick in the Playoff and title race for much of the year, which they definitely have the talent to do, Boykin will certainly be a Heisman frontrunner, being the star of one of the nation's best teams. Though, Boykin isn't the only explosive piece in this backfield. Tailback Aaron Green took over feature back duties midseason last year and exploded for crazy numbers. He had 922 yards and nine touchdowns, while averaging just over seven yards per carry. A full season of being the starter should make that rush average come back down to earth a little, but he should rush for well over 1,000 yards. A lightning bug of energy, Green's speed and elusiveness make him so tough to bring down. With B.J. Catalon off to the NFL, Green will get nearly every important carry for the TCU offense. Backing him up will be sophomore Kyle Hicks, a solid playmaker at running back. Much like Green, Hicks relies on his speed and quickness to make plays and is also helped by his rather small frame (hovering at around 5'10", 195 pounds). He doesn't have the proven big play potential of Green, at least not yet, but he is a reliable weapon who managed 160 yards himself in very limited duty. Hicks also proved to be a pretty good receiver out of the backfield (Green did as well, with 19 receptions), and that should only add another layer to this impressive TCU offense. Sophomore Trevorris Johnson is bound for a breakthrough 2015 after putting up 302 yards a year ago. Johnson is yet another explosive presence in the TCU backfield that can literally put up six every time he gets his hands on the football. Johnson and Hicks will battle hard for primary backup duties to Green, but expect the Horned Frogs to both of them in various ways. An interesting player to watch: quarterback Kenny Hill. It seems like ages ago that Kenny Hill was in the Heisman conversation but he was last season at Texas A&M, following some huge performances and a breakthrough season opener. Though, the Aggies slumped heavily soon and Hill was kind of unfairly blamed for the problems, and was benched in favor of Kyle Allen. Knowing his time at College Station had quickly come to an end Kenny "Trill", bolted to another college town inside the state. He isn't even eligible this season, but it will be interesting to see how he picks up the TCU offense and he could be the heir to Boykin come 2016. Receivers: TCU is absolutely stacked at receiver, which is scary, because they are stacked nearly everywhere else offensively as well. It starts with senior Josh Doctson, maybe the most proven of the bunch. Doctson recording over 1,000 yards receiving last season, with 65 receptions and 1,018 yards total. Doctson also proved to be a very reliable weapon in the red zone, with 11 touchdowns, using his athletic and strong frame to make tough catches against defenders. Also joining Doctson is going to be senior Kolby Listenbee, who is always ready for a huge play. A track star at TCU who earned All-American honors in Track and Field, Listenbee uses that amazing speed to gain separation from defenders. Listenbee finished up with 41 catches for 753 yards, averaging well over 18 yards per reception. While Doctson is more reliable and a little bit more experienced, there is no denying how important Listenbee is to this offense. Without his field-stretching ability vertically, he opens up things underneath for Doctson and the rest of this Horned Frogs' offense. While both of those are going to put together great years, perhaps even bigger things could be expected of sophomore Emmanuel Porter. Very young a year ago, Porter managed just 12 catches for a modest 154 yards. Though, even without crazy numbers, Porter showed amazing quickness and great hands. He has looked fabulous in the spring and Boykin should certainly be looking for the sophomore early and often as they head into 2015. Seniors Ja'Juan Story and Deante' Gray add experience and proven playmaking ability to the unit. Gray quietly put together a huge 2014-2015, with 36 receptions for 582 yards and ranking in second on the team with eight touchdown receptions. Despite not being the most explosive player on the football field, Gray is a great route runner who knows how to get into space and make plays. At 5'10", he has natural elusiveness and is very tough to bring down. Meanwhile, Story is a solid receiving weapon. He had 145 yards and one score himself, but will look to step up into a much larger role this season. Sophomore Desmon White is also ready for a breakthrough campaign for the Horned Frogs. At 5'7", White is very undersized but does most of his damage in more of a slot receiver role, working underneath to make tough catches in traffic. When he does get into space, he is incredibly speedy and can break open wide runs. Unfortunately, there may just be too much talent and experience ahead of him on the depth chart to really break out this year. The tight end position is in pretty good hands, led by junior Buck Jones. Jones is not really known for his receiving prowess, but can make plays in space, and is a proven blocker. Gary Patterson will probably have the luxury of not having too play much freshman whatsoever with the experience at receiving corps (unless injuries strike), but three-star Jaelan Austin is a local Grand Prairie, Texas guy who has a bright future. Offensive Line: The Big 12 is notoriously known as a finesse league without too much punishing plays in the trenches. But, having size and experience there is certainly a major plus to Green, Boykin and the TCU offense. The Horned Frogs have quite a bit of talent and experience, at the unit, with likely four of the five starters on the line being seniors. Together, those four seniors plus sophomore right tackle Joseph Noteboom should anchor likely the Big 12's top unit. Noteboom isn't very proven but the tackle has considerable upside and is a solid pass blocker. The top player on the O-Line has to be senior center Joey Hunt. Hunt earned All-Big 12 honors for his performance a year ago, showing wonderful leadership qualities and proving to be an excellent help as a run blocker. Hunt is far from flashy, few centers are, but he is a high motor guy with solid size and a proven resume. Joining Hunt on the line as one of the best linemen in the conference has to be left tackle Halapoulivaati Vaitai, who is yet another senior. Vaitai started all 13 games for the Horned Frogs at right tackle a year ago, but the opening at the important left tackle spot made the Frogs make the decision to make him right across the line. Certainly a few people took notice of the 6'6", 310-pound tackle's performance a season ago, and it helped him earned All-Big 12 second team honors. He will once more play a major role for TCU, protecting Boykin's blindside. Joining Vaitai on the left side of the unit, will be left guard Jamelle Naff. A senior, Naff is yet another established run blocker who put together a terrific 2014-2015 campaign. At 325-plus pounds he uses his large frame to bully opposing defenders but also has good enough mobility to meet incoming pass rushers in the interior. Rounding out the starting lineup with the guard on the opposite side, another senior in Brady Foltz. Foltz is another bulky, powerful run blocker who should put together a strong final season in Fort Worth. Depth shouldn't be too much of a problem in the unit either. Senior Aviante Collins is a massive tackle who can play either spot and will contribute, while sophomore Matt Pryor will fight for snaps at any number of positions along the line including guard and tackle. There are some pieces in the 2015 Class who could possibly see some limited action. Chief among them is three-star tackle Sam Awolope. Although not an incredibly hyped prospect, Awolope is a pipeline pickup and few teams do a better job at developing local prospects than TCU. Defensive Line: The TCU defensive line took a major hit before last season even began, when projected Big 12 Defensive Player of the Year was essentially dismissed from the university. After a year sitting out of the game, Fields has landed at Louisville and could be wonderful there. While his departure hurt the TCU pass rush, it was still strong enough to be productive. The defensive line takes another hit entering this year, with powerful defensive tackle Chucky Hunter graduating. Though, it should once more still be good, and Patterson has always prided himself on developing some wonderful pass rushers. The loss of Hunter leaves a void at one of defensive tackle spot, but the other one is going to be manned by senior Davion Pierson. Pierson is among the conference and nation's top interior linemen, as evidenced by a very good 2014-2015. He had 30 tackles, 8.5 tackles for loss and three sacks, kind of living in the shadow of Hunter. Now, Pierson is going to be relied on as the top D-Linemen on the team, and he should produce. He is blessed with good size but his athleticism is very impressive, helping him produce in run support and also as a pass rusher, evidenced by those three sacks, a pretty strong number for a tackle. The tackle spot left absent by Hunter should be handled by two juniors Aaron Curry or Tevin Lawson. Neither are huge (both weighed in right at around 280 pounds) but have very good mobility and know how to get the job done. Curry probably has the brighter upside of the pair and may be the permanent guy by the end of the season, but will have to fight off Lawson and more for the time being. TCU is blessed to have a number of great defensive ends on their roster, with plenty of experience. Senior James McFarland is the returning sack leader for TCU, after picking up seven sacks a season ago. He has great quickness off the edge and an incredibly high motor, despite being not very large either at just around 245 pounds. Junior Josh Carraway will fight with McFarland for playing time at one of the end positions. Senior Terrell Lathan is the likely starter at the other end spot. Lathan proved to be very good in rather limited snaps a season ago, with 10 tackles for loss and 5.5 sacks. Yet another experienced veteran, senior Mike Tuaua is also going to be in play for some action. Add in true freshman Breylin Mitchell, an important piece of this year's recruiting class and the end spot is filled to the brim with talent. Mitchell arrives from Round Rock, Texas widely viewed as a three-star prospect, but he has the frame and explosiveness to be able to contribute at the collegiate level right away, if he gets the opportunity. Linebackers: Although the TCU defense had some tough moments (61 points in their lone loss to Baylor), it was still widely seen as a strong unit, mainly because of the linebacker corps. Names like Paul Dawson and Marcus Mallett led a fantastic unit in the 4-2-5 Horned Frogs' defense. Patterson has always relied heavily on his linebackers. Since 2000, when he took over at TCU, the Horned Frogs have had the best rushing defense overall, beating out some SEC heavyweights and more. But, the reports out of spring practice were not very encouraging. Without Dawson and Mallet, who were both tackling machines, with 236 combined tackles this past year, the group has lacked leadership and just general playmakers. Patterson will lean heavily on junior Sammy Douglas, only because he is probably the most experienced of the unit. That isn't exactly extremely promising, considering Douglas managed a pretty modest 17 tackles last season in a reserve role. But, he did show great closing speed and the ability to rush gaps well and finish off backs. Obviously though there is going to be quite a dropoff from Dawson/Mallet. Dawson not only 136 tackles, 20 tackles for loss and four interceptions but he was pretty much the heart and soul of the defense, something that is clearly nearly impossible to completely replicate. The starter joining Douglas is a complete question. Redshirt freshman Ty Summers is a possibility, but he had a rough spring and is still obviously incredibly young. True freshman Mike Freeze has great potential but also is incredibly unproven and will need some time to adjust to the speed of the collegiate game. Sophomore Paul Whitmill is a pretty good option in coverage but also has some significant holes in his game. That leaves TCU with some serious question marks at a pretty key area entering the year. Though, I won't doubt Patterson; as I previously said, no team develops Texas talent quite like the Horned Frogs, and there is a lot of talent from the Lone Star state at the position. Patterson and co-defensive coordinators DeMontie Cross and Chad Glashow will work hard to get the unit going, but they won't have much adjustment time, as TCU opens against a run-heavy Minnesota team. Secondary: The Horned Frogs' secondary also suffers some severe losses, including aggressive safety Sam Carter and Chris Hackett. Though, it still has loads more experience and talent than the linebacker corps and it could still be looked at as a strength. Likely the leader of the unit and maybe the defense as a whole is going to be senior free safety Derrick Kindred. Kindred finished off third on the team in tackles, only behind Dawson and Mallet. He recorded 80 tackles, with 4.5 of them going for a loss. He also showed incredible ball hawking abilities, picking off our passes and returning one to the house. Kindred is absolutely wonderful against the deep pass, which is important in a league that is predicated around spreading defenses, especially vertically. Joining Kindred in the back will be an experienced commodity in senior Kenny Iloka. Iloka has been a longtime reserve to the unit, but has found ways to contribute in that role. Now, with the losses in the unit, Patterson and the Horned Frogs are looking for the veteran to step up in a huge way. He definitely has the talent to be an important player, considering his range and great tackling ability. Iloka should man the weak safety position, where he will have to make important defensive decisions, but he is ready. Junior Denzel Johnson is going to join up with Iloka and Kindred at safety, likely starting at strong safety. With 16 tackles a year ago, Johnson did prove that he could make plays while given the opportunity, but like a lot of this defense, he will probably need some time to adjust to a much larger role. The two cornerback positions are going to be pretty interesting. Underrated Kevin White was another piece that left this offseason, after recording 51 tackles, two picks and having 11 pass deflections. Sophomore Ranthony Texada was incredibly young last season but still managed to play very well, and will likely take over for White as the team's top corner. With 31 tackles and seven pass deflections in 2014-2015, Texada proved that he could be up to the role. Taking over opposite of him is likely going to be senior Corry O'Meally, or perhaps sophomore Torrance Mosley. O'Meally has an edge only because he has slightly more experience, but Mosley could be ready for a breakout year. He has excellent quickness and athletic and should put together a very productive year. Special Teams: Patterson will have the luxury of having a great kicker back in a TCU uniform, as senior Jaden Oberkrom earned All-Conference honors for his performance last year. He proved to be incredibly clutch, hitting a field goal that sealed the deal to beat West Virginia. Fellow senior Ethan Perry is going to return at punter after a strong 2014-2015. Nobody will want to play TCU this season. They have always been a very tough and sneaky team under Patterson, but this year they will be downright terrifying. 10 starters return to what could be the nation's best offense, led by a Heisman candidate at quarterback. The defense has some tough losses to overcome, but Patterson is a wonderful defensive mind and there is some great talent ready to take on increased roles. Even more important to the Horned Frogs' success this season will be motivation. The Horned Frogs were four points away from an undefeated season, four points away from a Big 12 title all to themselves and four points away from a Playoff berth. They will certainly remember the terrible feeling of just barely missing all those accolades, and will give the Playoff committee no reason not to put them in the field of four. A tough opener in Minneapolis against Minnesota is a possible upset, but other than that it is smooth sailing until the final two weeks. A meeting in Norman against Oklahoma won't be easy but Baylor in Fort Worth is going to be the Big 12 Championship game essentially. There is zero way TCU lets that game slip away this season.